Summer is almost over but the parties are not! 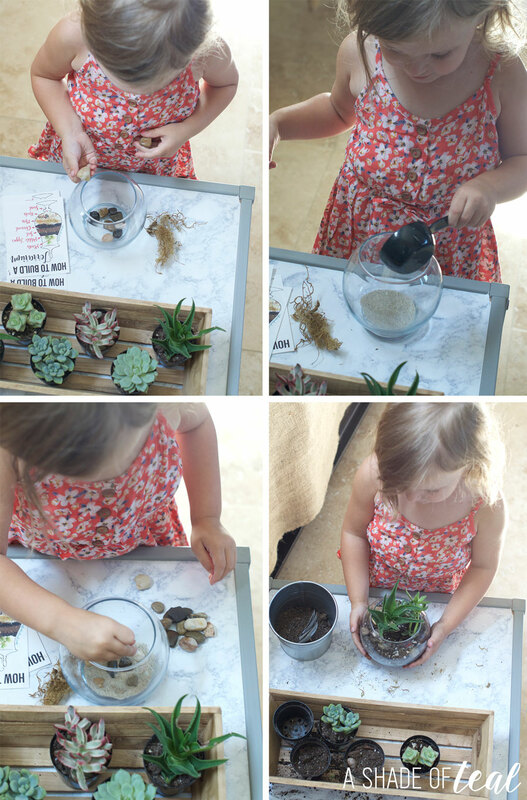 This summer I’ve been looking for new activities to occupy my daughter and I recently had her help me make a terrarium. She loved it so much I decided to throw a Terrarium Party! Challenging my daughter with new activities is really important; plus at 3 years old, new projects grab her attention longer. I know some of her favorite summer activities involved getting messy so throwing a terrarium party would be perfect for her. But if you’re like my family, having sensitive skin can be challenging; especially with new activities. My daughter LOVES to get dirty and play in the dirt. Even though my daughter and I have sensitive skin, I try not to let that limit us. I’ll let her play and get dirty just as long as we change and wash her clothes immediately after. 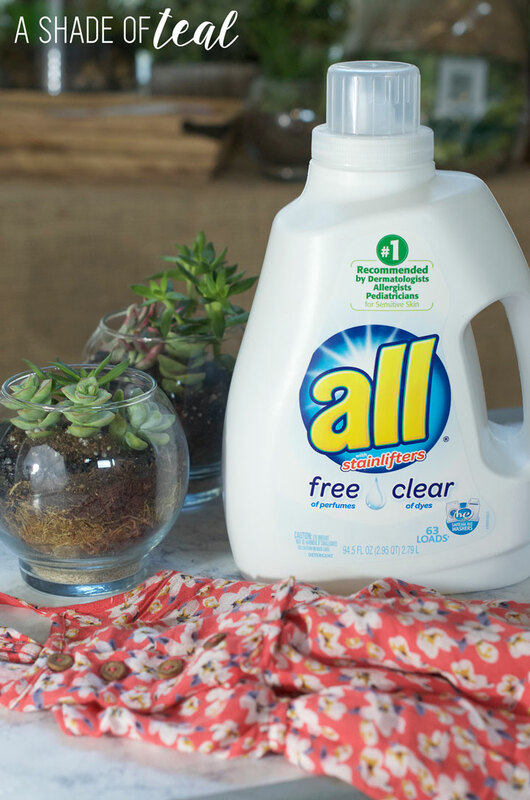 I always use all® free clear liquid detergent & all® free clear mighty pacs® to help my family deal with our sensitive skin. They’re the #1 detergent recommended by Dermatologists, Allergists, and Pediatricians for Sensitive Skin (all® free clear products are not intended to treat or prevent allergies). 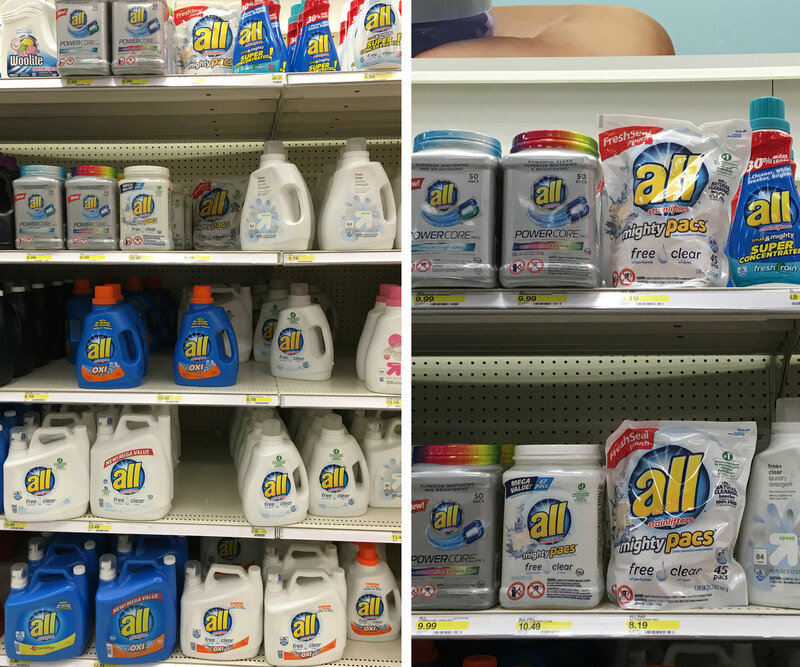 We’re definitely sensitive to grass, weeds, and pollen; but knowing we don’t have to deal with laundry detergent that irritates our skin is amazing. To make the assembly faster (and more fun!) I made a building bar with all the needed supplies. I gathered all my layering supplies in galvanized pots and had my plants and glass containers ready to go. Putting the terrariums together only take’s a couple of minutes. Below is a diagram of how to assemble open terrariums. Just add each layer in a glass jar or container and your good to go. It’s a perfect activity for a 3 year old to complete. Here are more pictures from my Terrarium Party! I also made mini cheat sheets on how to make a terrarium. These were a huge hit and you can purchase them for download here. My daughter loved how I had all the supplies in individual buckets. 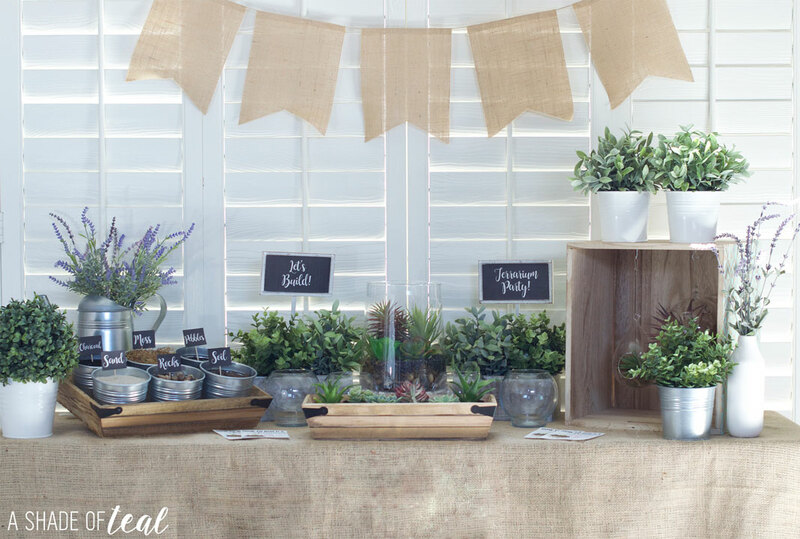 Plus it was so easy to create the terrariums this way. 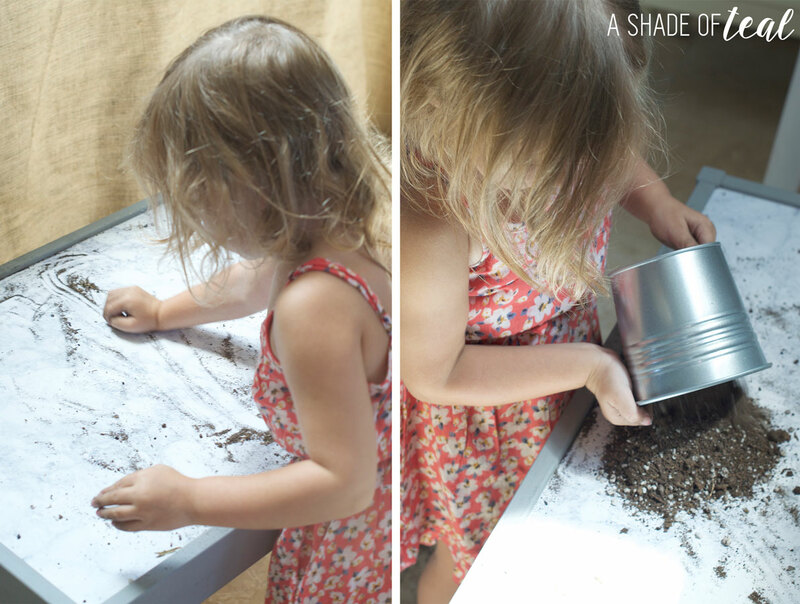 She had so much fun getting dirty and making her own terrarium. I honestly think her favorite part was “cleaning up”, and when I say cleaning up I mean making a huge mess. 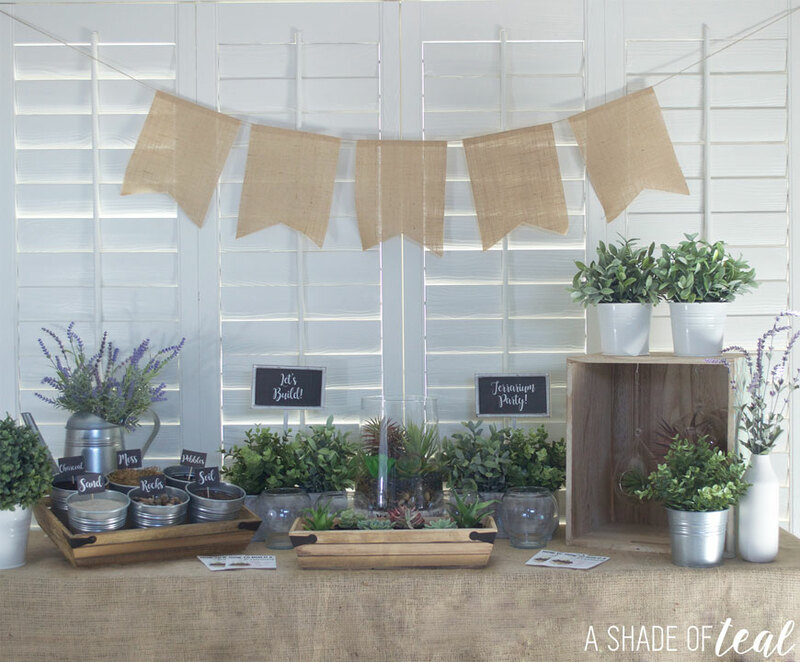 In the end my Terrarium Party was a success and another fun summertime activity. After an hour or so playing with dirt, her clothes were due for a washing. 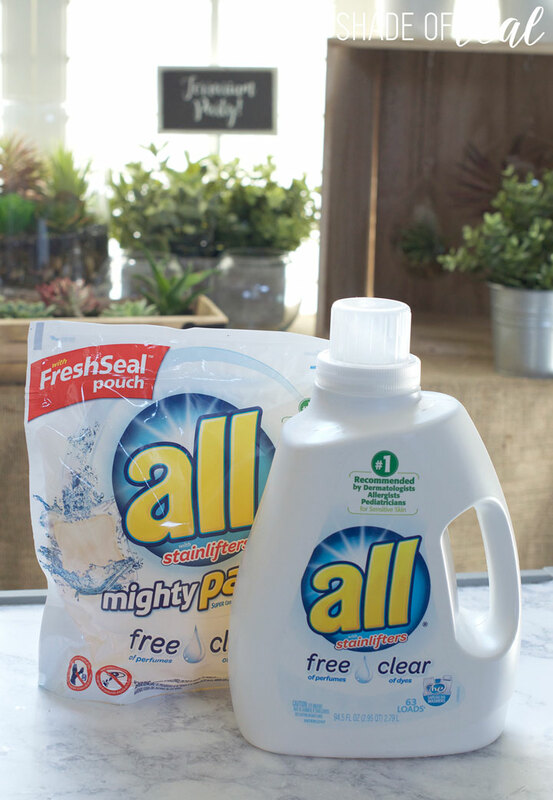 I definitely recommend all® free clear, you can find all® free clear liquid detergent & all® free clear mighty pacs® at Target in the laundry detergent aisle. Make sure you follow all instructions via the package. 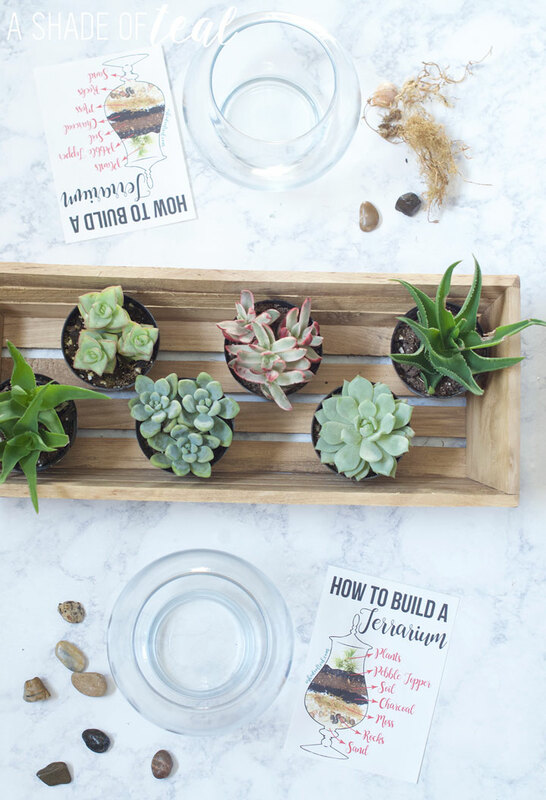 Have you ever made a terrarium? Have any summertime activities that your kids love to do? 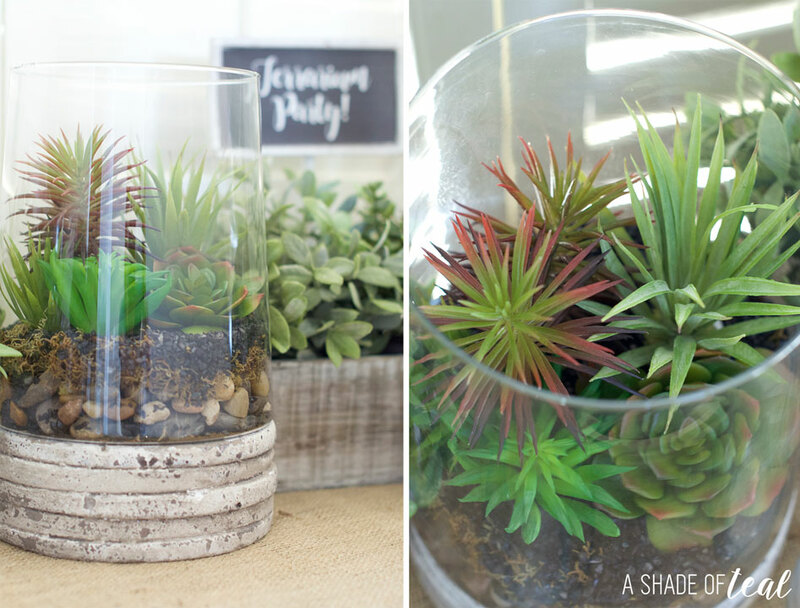 Looking for this Terrarium printable? You can purchase it here. I love terrariums! 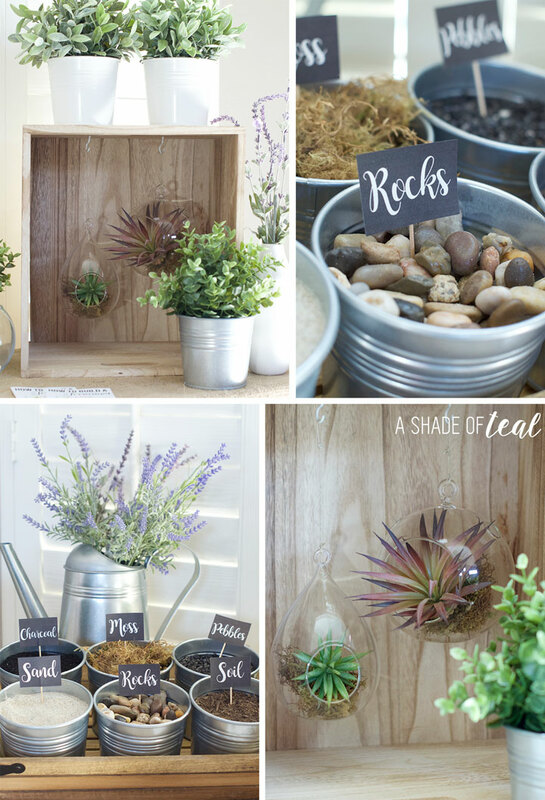 I will try to do my own terrarium with these ideas. Than you! What a fun idea for a party. I need to do this with the ladies at my church. What an awesome idea. Thank you for sharing. These look amazing! They also look easy to make! Haha the last terrarium i built was for my tarantula. guess its not the same thing but this is amazing. i would love to make one of these. they look amazing. What a great idea and to get the kiddos involved too! What a super idea! 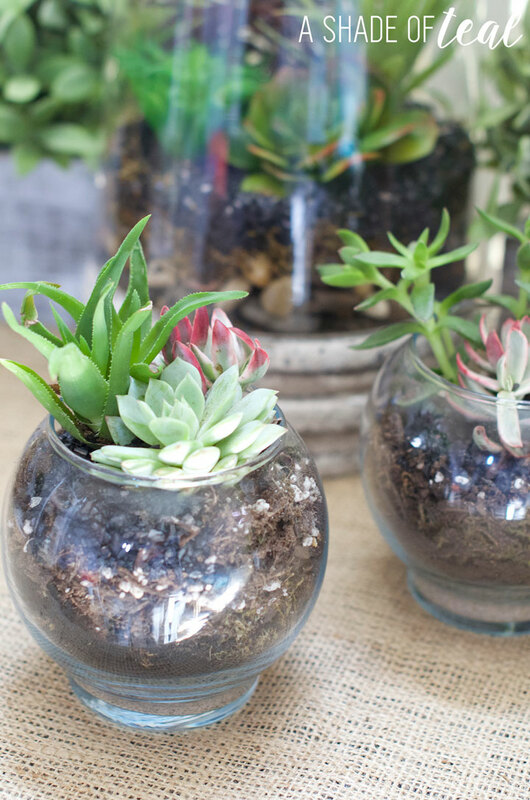 My kids would love to make their own terrarium. Will be pinning this. Oh, a terrarium would add some beauty to my kitchen. I like that it wouldn’t take up too much space. That’s fun that you gave us a tutorial on the layers. Everything looks really great! This looks like a lot of fun and it’s something that the kids will enjoy doing as well. I so love the idea of having a party like this! This is so cool. I would love to do this with my nieces. I love terrarium. That is too awesome! I love succulents but I’ve been doing it wrong all this time. I’m going to use this to redo my terrariums! Do you have a printable for the cheat sheet? Would love for my mom’s 60th birthday! I currently don’t offer it, but if you would like to purchase it let me know and I can set it up in Etsy. Thanks! Would love to purchase the pdf of your cheat sheet!! Thanks!! Yes, but you don’t have to add the pebble topper, its mainly for appearance. How many people is this specific party for? I’m going to purchase everything, but I’m not sure how many I need of each! Hi Katy! These look super cute. I am wondering if you know the size of the terrarium containers, and/or have a link to where you purchased them. Thanks! They were about 5″ wide and tall. Then I actually purchased them from a local wholesale store. Love this! Getting ready to do this for a girls night! the little signs for the buckets did you make those or buy them and if so from where? I want to do this with my church, for apx. 40 ladies, how much of each material should I buy? Or could you tell me how much goes into 1 so that I can order enough?